Your Horse - Mar '13. Equestrian Trade News - Oct '12. Equestrian Life - Oct '12. Your Horse - Sept '12. Field and Rural Life - Jun '12. Local Rider - May '12. Horse and Hound - 26 April '12. Absolute Horse - April '12. Horse and Rider - April '12. Horse and Hound - Feb '10. Andrew's Regional successes! HorseScene - July '09. Question and Answer with Andrew. Local Rider - Jun '09. 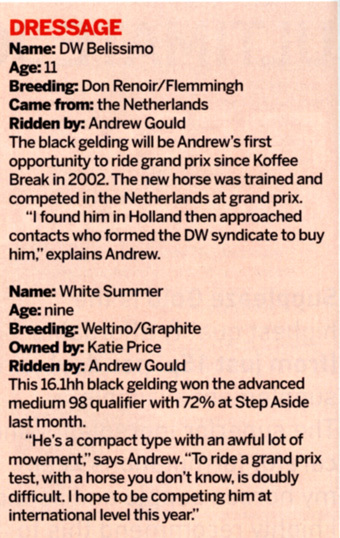 Article on Andrew taking to Eventing. Sunday Telegraph - May '09. The Sunday Telegraph interview Andrew. Horse Deals - Apr '09. 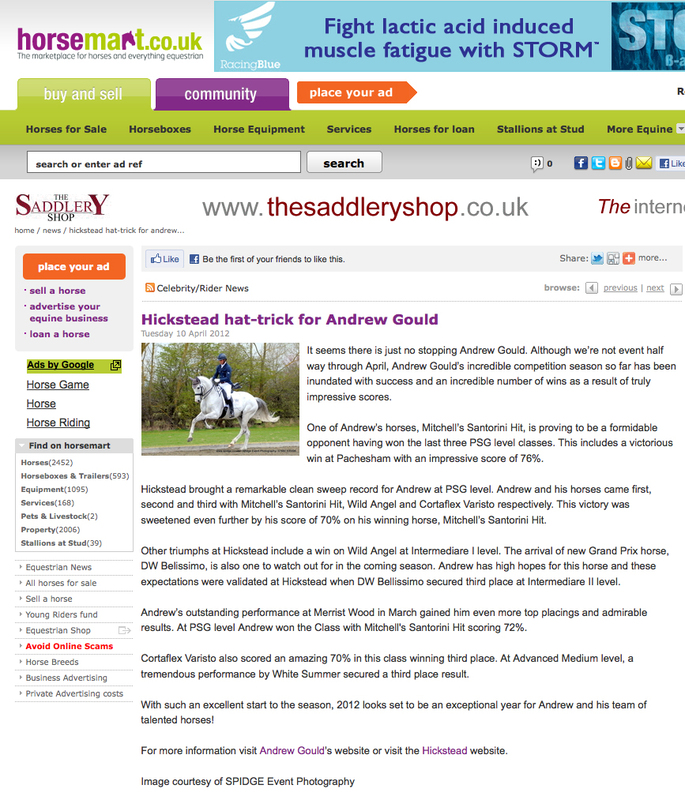 Article about Ruth Edge's horse Shadowfax, bought from Andrew / Priory Dressage. Your Horse - Apr '09. Andrew Gould features in Tall Tales. Horse & Hound - Mar '09. Andrew Interview. Your Horse - Jan '09. Andrew gives his expertise in a training session. HorseScene - Jan '09. Andrew gives his winter tip. British Dressage - Jan '09. Andrew joins forces with Nupafeed is featured in the sponsorship news. West Sussex Gazzette - Oct '08. Dressage ace looks to step up next year. telegraph.co.uk - Oct '08. Andrew and Katie Price taking part in Horse of the Year dressage event. timesonline.co.uk - Oct '08. Andrew and Katie Price presence at the Horse of the Year Show. HOYS.co.uk - Oct '08. 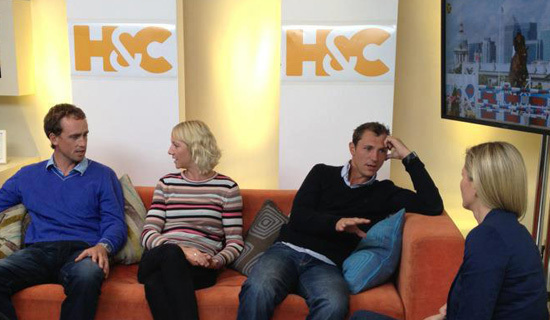 Andrew and Katie Price Masterclass at Horse of the Year Show! Farmers Guardian - Oct '08. Andrew and Katie Price dressage display at HOYS. Times - Oct '08. Andrew and Katie Price Performance receives great reception. Sunday Times - Oct '08. Andrew and Katie Price performing at HOYS. Local Rider - Nov '08. Andrew leads the Pantomime Horse Derby. Horse Scene - Oct '08. 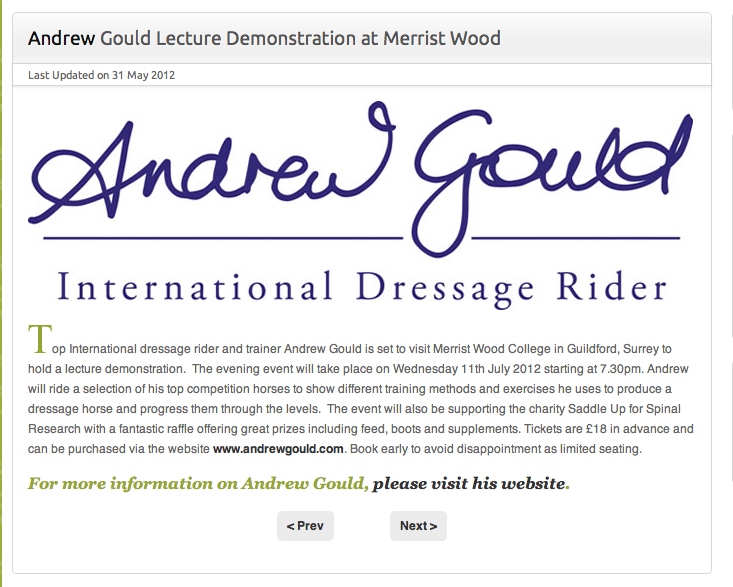 Andrew gives top tips on buying a dressage horse. Horse Deals - Oct '08. Andrew supporting Breast Cancer Campaign. Horse - Oct '08. Andrew riding Jordan's Glamour Girl at the Breast Cancer Campaign. Equestrian Lifestyle - Oct '08. Pictures from Andrew supporting the Breast Cancer Campaign. Equestrian Trade News - Sept '08. Andrew supporting the Breast Cancer Campaign. Horse Scene - Sept '08. 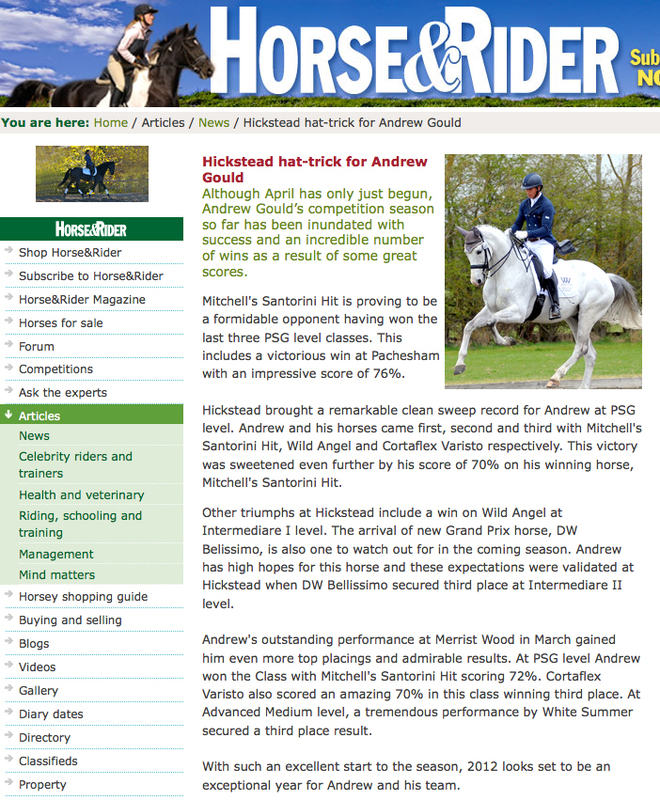 Andrew's article about preparing for dressage competitions. Equitrader - Sept '08. 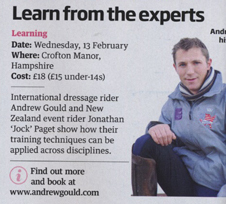 Andrew to appear at HOYS with Katie Price. Kent & Sussex Courier - Sept '08. 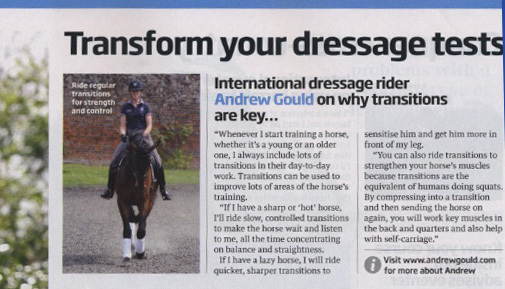 Eventing pupil Emily Llewellyn mentions Andrew as her dressage trainer. Horse - Sept '08. Andrew Gould Master Class. Horse - Sept '08. Andrew and Katie Price at Hoys. Billinghurst Times - 29 Aug '08. Andrew's support of the Breast Cancer Campaign. Daily Star - 01 Aug '08. Andrew and Katie Price at Hoys. Daily Express - 01 Aug '08. Andrew and Katie Price at Hoys. Horse - July '08. Web focus on Andrew's site. Horse - July '08. Andrew's new pupil Katie Price. Horse & Hound - July '08. Medstead Grange, Hampshire review. Horse & Hound - June '08. 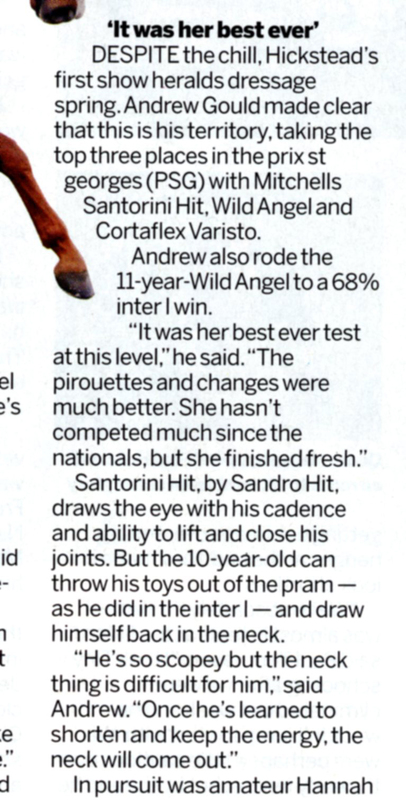 News on Andrew training Katie Price. Horse Scene - June '08. News item about Andrews new website. Horse Buyer - July '08. Andrew Gould profile. Equestrian Lifestyle - June/July '08. Interview with Andrew Gould. Horse & Hound - May '08. Championship qualification review. Local Rider - Feb '08. Front cover. Horse & Hound - Aug '07. Southern Regional Championships. Horse & Hound - May '07. Hickstead Review. Horse & Hound - Mar '07. Midlands Winter Regionals Review. Horse magazine - Sept '06. Gould Rush. Andrew Learns Polo. 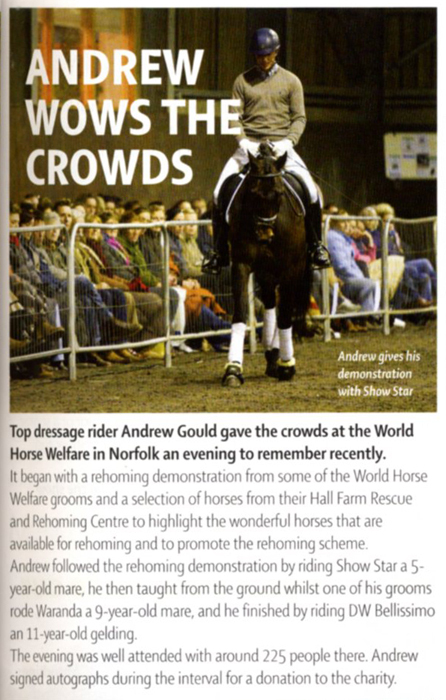 Horse magazine - Jun '06. Going For Gould. Rider Profile. Horse & Hound - Apr '06. Winter Championship review. Local Rider - Apr '06. News - Report of success. Chiltern & Thames Rider - Mar '06. Southern Winter Music Regionals review. Horse & Hound - Nov '05. Unex Masters review. Horse & Hound - Jun '05. Hickstead review. Horse & Hound - May '05. Clothes Feature. Cortaflex Varisto won the Advanced Medium yesterday & Waranda won the Medium today. White Summer was 2nd and 3rd in the Advanced Mediums & Wild Angel was 6th in the big PSG & Inter I classes. Habanero was 6th in the other PSG class. So all in all a very good start to the season! Andrew will be busy at the High Profile Addington Manor EC show over the next few days, competing no less than six horses! Andrew will be competing Cortaflex Varisto, DW Bellissimo, Habanero, Warada, White Summer and Wild Angel across the levels. 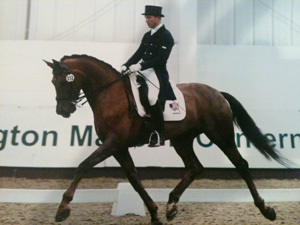 His impressive entry list has been also been highlighted by the British Dressage website news pages here.